An estimated 60 – 100 million feral cats – cats who have never had contact with humans and who are the offspring of abandoned, unaltered tame cats – are roaming the parks, parking lots, back yards, and back streets of America. (1) Although ferals are fearful of humans, they are still members of a domesticated species, and they are ill-equipped to survive on their own. Feral cats do not die of “old age.” Many are poisoned, shot, tortured by cruel people, attacked by other animals, or hit by cars. Others die of exposure, starvation, or highly contagious fatal diseases, such as rabies, feline AIDS, feline leukemia, and feline infectious peritonitis. A Florida man shot one cat and was suspected in the deaths and disappearances of at least 16 others in one feral cat colony; he claimed that the cats were “attacking” his daughter. (2) In Wisconsin, a man beat a feral cat to death with an aluminum bar because he was afraid of catching rabies. (3) One cat in a Hawaiian colony was found with a 4-inch needle embedded in his leg after being shot with a dart. 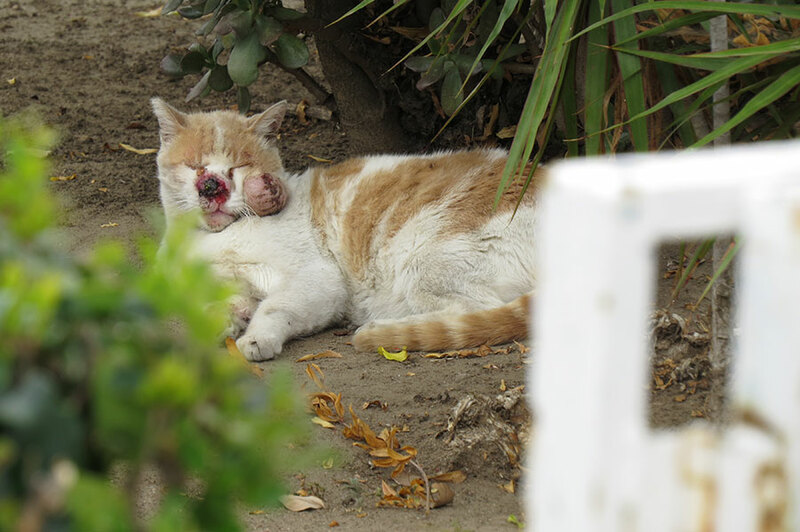 (4) These are only a few examples of the myriad horrible injuries and deaths that feral cats suffer. Even easily treatable conditions can be deadly for cats who are not seen by veterinarians or otherwise taken care of by humans. Minor cuts or puncture wounds can turn into raging infections and abscesses. Untreated upper-respiratory infections cause cats’ eyes and noses to become so caked with mucus that animals can barely see or breathe. Ferals often scratch their ears until they bleed, because they are driven mad by the pain and itching of ear mites and related infections. Others die from blood loss or anemia because of worms and fleas. Urinary-tract infections, which frequently lead to urinary blockages in male cats, cause slow and extremely painful deaths if they go untreated. Many people who encounter feral cats start feeding them, but merely feeding the cats without capturing them can actually make the situation worse. Feeding ferals increases their ability to give birth to more kittens who are destined to suffer and die painful deaths. It is essential to get these cats off the streets in order to prevent suffering for both them and their offspring. Feeding should only be done as a prelude to trapping, as a way of getting cats accustomed to eating in a certain place at a certain time. Before trapping animals, obtain written permission from the owner of the property where the cats roam. Wear thick gloves, as handling feral cats can be dangerous for both the cats and the handler. Be gentle: Even humane traps (box traps) can terrify animals who have never been confined. Line the bottom of the trap with a piece of cloth, a folded newspaper, or an old towel. It will not interfere with the spring mechanism, and the animal will be afforded a small measure of comfort. Do not use the same towel or cloth again for the same purpose unless you have washed it well – animals are very sensitive to smells. Do not set a trap and then leave it unattended, even for a few minutes. Anything could happen while you’re away. Set your trap, then back off, but stay within sight of it. Be patient. Plan to do your trapping when you have enough time to stay onsite. Avoid trapping in bad or extremely hot weather. Cats are most likely to be up and about during early-morning or late-evening hours. Place the trap on firm, flat ground so that it does not wobble when touched. Turn the trap so that when animals enter, they can keep an eye on your car, your door, you, or whatever danger that they would rather not turn their backs on. Place a small trail of food leading to a large feeding clump at the back of the trap. Use smelly canned food as bait, and place it on a paper plate or a piece of newspaper. Avoid putting bowls or cans inside the trap. When animals enter, they may thrash around trying to escape, and a can or bowl can cause injury. Immediately after the animal goes in, cover the trap with a towel or a blanket (if you are trapping in cold weather) or a sheet (in hot weather). Trapped animals calm down more quickly when they are covered. Gently carry the trap to your vehicle. The cat will be frightened, so be aware that even small movements or noises can aggravate his or her stress. Don’t slam doors. Always use a vehicle. Even if the animal you want to trap is a few blocks away, drive or have a friend drive you. It can be difficult to walk even a short distance with a terrified cat struggling in a trap. Make arrangements ahead of time for where you will take the cat after he or she has been trapped. Never assume that the animal will be accepted unannounced. If you plan to rehabilitate and adopt out the cat, it is best to immediately take him or her to a veterinarian to be spayed or neutered, vaccinated, tested for leukemia and AIDS, and treated for worm and flea infestations. If it isn’t possible to take the cat directly to a veterinarian or an animal shelter, transfer him or her to a larger carrier that’s equipped with a litter pan, food, and water by putting the open carrier next to the trap and opening the trap door. Never turn feral cats loose in the house – you may not see them again for days, and it may be difficult to trap them again when you’re planning to take them to a veterinarian or an animal shelter. After bringing cats home from the vet, put them in a quiet place separated from other animals for a week or two; this will allow them to recover from surgery and become accustomed to their new surroundings. When the cats have recuperated, they can be released into the house, but it may take months (or years) of patience and kindness before the animals begin to trust you. Do not allow feral cats outside, even after they have lived in your home for a long while. They are easily frightened and may bolt and become lost. Because of the huge number of feral cats and the severe shortage of good homes, the difficulty of socialization, and the dangers lurking where most feral cats live, it may be necessary – and the most compassionate choice – to euthanize feral cats. You can ask your veterinarian to do this or, if your local animal shelter uses an injection of sodium pentobarbital, take the cats there. Please do not allow the prospect of euthanasia to deter you from trapping feral cats. If you leave them where they are, they will almost certainly die a painful death. A painless injection is far kinder than any fate that feral cats will meet if they are left to survive on their own. If your local animal shelter will not lend you a box trap, invest in one of your own. Cat traps cost $40 to $50. 2) John Tuohy, “Man Fined in Shooting Death of Cat,” Florida Today 3 Jul. 1999. 3) Ed Treleven, “Cruelty Charge to Be Dropped in Beating Death of Feral Cat; District Attorney Feels Jury Would Decide Fish Hatchery Director’s Action Was Justified,” Wisconsin State Journal 23 Mar. 2002. 4) Pat Omandam, “Cat Lovers Upset at UH Treatment of Feral Felines,” Honolulu Star-Bulletin 25 Sep. 1998. 5) Timothy Hurley, “Cats Suspected in Sea-Bird Kill on Maui,” The Honolulu Advertiser 9 Aug. 2002. 6) Lawrence G. Proulx, “Free-Ranging Felines Fall Prey to Their Own Survival Skills,” The Washington Post 3 Mar. 1997.